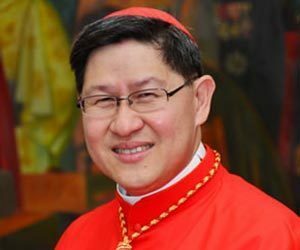 Cardinal Luis Antonio Gokim Tagle, a dynamic, persistent and humble advocate for the poor and marginalized in his native Philippines and around the world, will receive the Ford Family Notre Dame Award for Human Development and Solidarity at a campus ceremony at 8 p.m. March 24 (Friday) in the McKenna Hall Auditorium. Following the award presentation, the cardinal will deliver an address on integral human development. Both the ceremony and the lecture are free and open to the public. The 32nd archbishop of Manila, Cardinal Tagle serves as the president of Caritas International, a confederation of more than 160 Catholic relief organizations that work to end poverty, promote justice and restore the dignity of the most vulnerable, regardless of race or religion. “Cardinal Tagle is cut of the same cloth as Pope Francis, who named him president of Caritas,” said Rev. Robert Dowd, C.S.C., director of the Ford Family Program in Human Development Studies and Solidarity, which presents the award. Known for his friendly demeanor and approachable nature, the cardinal prefers to be called by his nickname, “Chito,” instead of his full title. Media savvy, he has a large social media following, particularly on Facebook, allowing him to spread his message of hope and forgiveness to people across the globe. Tagle has spoken out strongly about issues impacting the poor and vulnerable in the Philippines and around the world. He has stood firmly against the death penalty and political corruption and worked vigorously toward a Catholic response to issues such as the international refugee crisis and climate change. Cardinal Tagle will also open the annual Romero Days commemoration, a project of Latin American North American Church Concerns, by celebrating Mass in the Basilica of the Sacred Heart at 5:15 p.m. March 24, 37 years to the day after Archbishop Óscar Romero was assassinated in El Salvador. The Ford Family Notre Dame Award for Human Development and Solidarity, presented by the Ford Family Program in Human Development Studies and Solidarity at the University of Notre Dame, recognizes substantial contributions to human development through research, practice, public service or philanthropy. Recipients are honored for standing in solidarity with those in deepest need, supporting them to become agents of their own change. Past recipients of the award include Amina Mohammed, now the deputy secretary-general of the United Nations; L’Arche and its visionary founder Jean Vanier; social entrepreneur Jacqueline Novogratz, CEO and founder of Acumen; development economist and Nobel laureate Amartya Sen; Partners In Health, whose co-founders Paul Farmer and Ophelia Dahl accepted the award on its behalf; and Patti and Ray Chambers, the United Nations Secretary General’s Special Envoy for Malaria. The Ford Family Program in Human Development Studies and Solidarity is a program of the Kellogg Institute for International Studies. Part of the University of Notre Dame’s new Keough School of Global Affairs, the Kellogg Institute is an interdisciplinary community of scholars and students from across the University and around the world that promotes research, provides educational opportunities and builds linkages related to democracy and human development, two topics critical to our world. Originally published by Elizabeth Rankin at news.nd.edu on February 27, 2017.